would anyone be so kind to please answer my question who to contact? it has passed by far over one month, almost one month and a half since i opened this post and still no reply matching my question. In the past three DAYS i lost over $15000 when i was forced to close three positions in GIANT loss. I was working so hard, FOR YEARS, waking up at 4:30am, to earn some money to deposit. I don’t feel responsible for the loss and i think i got scammed by the broker who changed direction of a trend just to make me loss. I have no way to look into the future to know where the price will be, although I am still saying that i have good (but very basic) knowledge of news trading: two opposite Stop pending orders. News events goes, as a consequence of event, into one direction, executing one pending position and custom tool automatically cancels opposite one. But i really need to know how to figure out whether the exact event will move the trend? I am being extremely worried that some other cause/consequence and not exact event being analyzed, will move the trend then when event will, it will do it to opposite direction making me loss that i am not responsible for. While i am struggling to find some free of charge consulting service (i spent all my money for losses so cannot pay anything), i am asking myself how is possible that broker expects me to literally look into the the future to know where the price will be in few hours or few days. I am not a mind reader, neither future reader. My original question, in bold fonts, remains. Thank you a million times to anyone who could please assist before i die due to no income and inability to pay anything to survive. I think you have made a strong effort to follow your original strategy and trading style. However, you are unable to limit your losses sufficiently. You haven’t said why you entered the 3 trades mentioned or why you exited them where you did. But it would not be unusual for a trader even using a profitable well proven strategy to have 3 consecutive losers. A good strategy without good risk management will fail. My advice would be stop hunting for better information about news and take a really long hard look at how you manage risk. What you are seeking is not so easy to describe, the best description was by M Douglas as ‘trading in the zone’. Check my recent posts - often I’m describing what is likely to happen up ahead on cable, especially for the week ahead. But it’s not an exact science like TA is supposed to be, it’s a sense of how the market feels about current affairs relating to a particular country. So being in the ‘zone’ you think about GBP - has anything changed on the Brexit news? - no, so instead of buying rumours sell this fact. Draw a line this past week on 2680 - see how often the rumour suggested a buy, see then that a sell right at this level was a winner more often. Oh - forgot about that - 2680 became a pill too bitter to swallow for buyers - see how price managed 2685 and baulked, then down more than 100 pips - that post was Thursday morning - there were two more efforts at 2680, then yesterday the drop. No takers (buyers) for the offer methinks - that’s levels and FA . What about nest week? - sell the highs perhaps - although there are rumours afoot in Westminster and as always - don’t buy the rumour, wait for the fact. One other thing, get to know your own country’s currency and economy, learn how the market reacts to news. I know zilch about MXN, I remember possibly a new President and maybe he made comments that the market liked and MXN was bought - if this is so then that is buying the rumour, it has no substance, no numbers, it’s like the story of the naked emperor. As soon as something real happens - like the road thing, that’s the little boy shouting that the emperor has no clothes, sell the fact. I could be wrong about MXN but the ‘zone’ element is correct - it takes a while but get into that zone. tommor two of three closed trades in giant loss (wasted over one year of working in my almost zero paid job on employer) where opened because there was clear either double top (proving downtrend) or double bottom (proving uptrend) pattern already formed. When said pattern is formed, the trend must go to mentioned direction. Since it didn’t, i assume that i got scammed by the broker who ‘‘sent’’ the trend to another way to make me loss my close to impossible to earn money. I work like 12 hours per day and my monthly salary is believe it or not around $400 (four hundred). In three days on three positions i lost over $15000 (fifteen thousands so you wouldn’t think one zero is accidentally typed). The third position was opened because the news event indicated so AND because on the same day, there had been no previous news for same currency pair (or single currency) announcing opposite direction. I must be able to manually confirm that on H1 chart (assumption2). Why H1? Because i think its the most appropriate one to judge if the trend is really moving. or anything like that showing in the title of news or in its content that there is no clear upward or downward trend. So using all three assumptions, I believe this could be fair solution for my main problem: how to know whether or not particular news post (particular event) will have the consequence of trend moving on chart. There is another problem which can occur: protecting myself from the fact that something else (some other factor) would in reality move the trend (executing one of my pending orders) and when the exact news post (exact event) being analyzed would really start to have the consequence on chart, it would move to the other direction. I am worried A LOT about this, very very very worried and would ask for some help please on this. The best thing i was thinking about is: looking for keyword of currency or currency pair (obviously the one i am considering to open two opposite pending stop positions for) in the Eikon’s news feed and check all the daily news* to make sure that no news are there that could (but how would i be able to know this if i cannot evaluate it due to missing knowledge on that?) 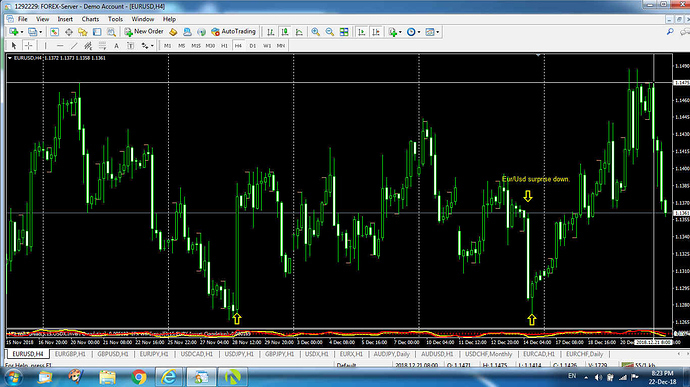 show that currency or currency pair is going to the opposite direction. However even additional problem is the following: I described what could be solution for inability to know the direction as a consequence or a trend but how would i know then which pending positions will be most likely to be executed so i could see which opposite direction daily news* should NOT occur? I don’t know how to protect myself from the fact that some other element, instead of exact analyzed event, would execute the pending position. Thanks YourFriend0. I’m sorry I can’t help you as I believe you are a space cadet. Your trade with exceptionally high risk as you put $15000 at risk over 3 trades in 3 days. You think a double top or a double bottom is reliable for trading. You conclude that when the market didn’t go your way, it was because your broker moved the market against you. If there is anything I could say to help, it would be “Stop trading”. Yes, Tom is correct, you have to step back and learn some more. Always examples - back last June the ECB signaled that they would cease QE in Dec, so most people would say that this news in ‘priced in’. But not so - in today’s robot driven market there is the need for confirmation, the robot cannot think (not yet) but it is good at reaction. So come Dec 13 and confirmation from ECB that QE is finished - so Euro rise? Nope, Eur/Usd FELL Dec14 at 8.00 gmt . What went wrong? - nothing really, the bots were charged with their buys, the news confirmed the direction - thing is there needed to be a level, somewhere that there would be a bunch of buy orders - always seek value if buying, the better the discount the more the buy. Where would that level be? Always close by, imagine a bunch of Euro buys, so much so that price jumps (hr1) - so think to yourself -wonder did all the buys get filled, wonder would there be more sitting there, would they pull those buys, has anything changed to cause that.? Btw, note where the bots were programmed to take their profits yesterday. Finally, you have combined TA and FA - a double bottom and end of week/month with a double top and a close of position with profit. Now you have to look at the USD and Gold and learn what has happened there in this past week - see the influence on Euro? tommor: every resource you find about double top and double bottom patterns will say that double top is announcing downtrend and double bottom is announcing uptrend. I was even waiting for confirmation candle to be fully formed. This is not a lottery where you bet on luck only. If the trading education, at least theoretical one, is including particular facts then those facts need to be respected by the trends in practice (real trading) too. I cannot look into the future to see what will happen. So there are rules that need to be respected. How could i had known that there will be uptrend after double top plus confirmation candle? I am sure the broker scammed me here. After double top has to be downtrend as all education resources are saying. I cannot just bet and hope that something will happen. Education needs to be realized in real trading too. peterma, most of my recent giant losses occurred on poor CAD and poor RUB because of oil. I had no way to know that bad news for oil means bad news for CAD and RUB but i knew that bad news, since both cad (usdcad) and rub (usdrub) where on the right side of trading symbol, meant uptrend. I was in downtrend positions. On usdcad around 2 months. On usdrub around 5 days. Why did i open downtrend positions? Because i didn’t know there is anything bad about oil going on. Even if i did, i wouldn’t know this means bad for CAD and RUB so the direction of downtrend would most likely be still taken. This is big failure by me for sure. On friday i saw good news for EUR so i opened uptrend position but then got scammed again because trend went down. No idea how this is possible. News where clearly saying that EUR is going good and it was far away from resistance line. Peterma, I am sure that we are talking about the same situation on EURUSD but happening at different time. My was opened (uptrend) on 21th Dec because i saw good news about EUR and even uptrend announcement on EURUSD. However, i didn’t understand your suggestion ‘‘seek value’’. I would appreciate if you could please explain what kind of work would i had to do to predict that EURUSD is going down and give ‘‘decision priority’’ to this prediction rather than news event. I don’t understand what where you saying (btw, are you using for this any custom MT4 tool?) in your message containing screenshot. Surely there had been resistance line before i opened EURUSD uptrend position on 21th Dec and the main rule of trading is to give priority for retracement from resistance (or support) line and not upward or downward cross. But still based on the news event i saw 21th Dec, it should be uptrend. So my answer to your question is no, i don’t see anything what would cause EUR (downtrend on eurusd on 21th Dec) to be affected because of USD or Gold. All those problems with evaluating the event can be (partially) solved with two opposite pending stop orders but here problems occur - i already described them but haven’t received any solution on this yet. Hopefully someone could please reply on this. The oil, cad, rub was lecture forever. Now i will for sure know it but i hope i will be able to see good or bad news about oil fast enough. My main worry remains the same: pending stop order to be executed by something else instead of news event which was (referring to event) the reason for me to open two opposite stop pending orders on the same trading symbol. Then when news gets effect on chart, it would go to the opposite direction. How could i protect myself from this? Another sample is in attached file. This sample is about the problem of figuring out whether the event will cause trend movement or not. Kindly see attached file please. Fortunately in this sample the title of the event is saying to which symbol is event related to: Since two countries are mentioned already in the title, the answer is obvious: symbol USDCNY. It would be very hard if country/ies name(s) was/were missing. Or if individual’s name weren’t available. Based on individual person’s name, it is easy to google it for info where he or she is coming from and lookup for this country’s local currency. But it is beyond my understanding how can i know whether or not this attached event will move the trend on USDCNY? Even more complicated: If USDCNY moves, how could i know that pending stop order (either buy or sell) will be executed because of this EXACT event? You say that when a double top becomes an uptrend its because you the broker made it. You have no hope of making money from trading. Stop now. and hundreds of other resources about double top and double bottom to make sure that i don’t lie. Besides this, i even waited for confirmation candle to be formed. Its clearly said that double top means downtrend is coming. I am not future reader or mind reader to know where the price will for sure go. Trading is not a lottery where i would earn from luck only. But this is OFFtopic because i am asking completely different question(s) and still, after 14th Nov, waiting for the answer(s). Not wishing to repeat and not wanting to blow my own trumpet, check out what I posted back on Nov 11 when there was a suggestion from Saudi Arabia about a cut in oil production in order to raise price. Think about what had happened in that country to a US resident and how the US President was constrained in how to react, and then that same country aiming to raise price. Canada is a commodity country, one of the comm dolls - commodity dollars, so the price of commodities affects the value of CAD. Oil price influences the price of all commodities. In such an environment the FA suggests the safer side is a sell on CAD . Edit: btw not much cold yet here. The market is made up of us humans with all our weaknesses and traits. Friday past was the end of the week, the end of the month and the end of the year, traders were off early, either heading to a bar or older guys off home. There is no way that these guys leave positions open - they close, so if they have been buying they have to sell to close. If nothing has changed and price has risen as expected and you have a pocket full of money and want to get into the action. The one big rule is not to chase, the market usually shakes out chasers, look to where price left off (hr1) in a hurry, good chance it will head back there to pick up the buy orders that never got filled because the matching sell orders were not there - there are new sell orders there now because price is heading down. Now to gold and USD - correlation is what drives the notion of ‘the zone’ it fluctuates with current affairs. The thinking behind Gold vs USD is very old, in times of trouble people buy Gold and also Yen. You will have to research yourself why Yen, the info is out there. Anyways if the market is buying Gold then it’s selling USD on the day. Here is how TA and FA meet, see the d1 on Xau/Usd - price reached a level and of course back to that earlier post - Friday, Dec 21 it turned - now check Eur/Usd same day…guys off to the bars.